Who should be the new UN Rapporteur for Human Rights Defenders? Ravindran is my choice. 62 regional and international organizations expressed their outrage over the Lao Government’s ongoing failure to shed light on the enforced disappearance of prominent human rights defender Sombath Somphone. 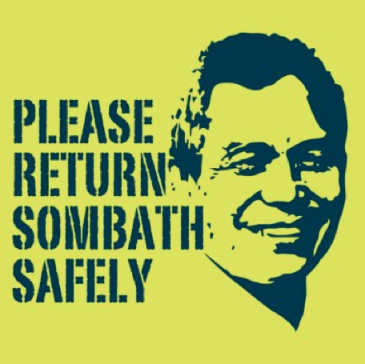 Sunday 15 December 2013 will mark the one-year anniversary of Sombath’s disappearance. Sombath was last seen on the evening of December 15, 2012 in Vientiane. Closed-circuit television (CCTV) footage showed that police stopped Sombath’s car at a police post. Within minutes after being stopped, unknown individuals forced him into another vehicle and drove away. Analysis of the CCTV footage shows that Sombath was taken away in the presence of police officers. This fact supports a finding of government complicity. Despite the Lao Government’s pledge to “thoroughly and seriously” investigate Sombath’s disappearance, the authorities’ probe has been inadequate and unproductive and there has been no progress in the investigation. On 9 December 2013, 4 human rights defenders [Ms Razan Zaitouna, Mr Wael Hamada, Mr Nazem Hamaadi and Ms Samira Khalil] were abducted by masked armed men and taken to unknown whereabouts in Syria. They were kidnapped from the offices of the Center for Documenting Human Rights Violations in Syria, located in Douma. Razan Zaitouna is an award-winning human rights defender who worked on the rights of political prisoners in Syria before the revolution, and continued her activities throughout the peaceful uprising in 2011, founding the ‘local coordination committees’. In 2011, she received the Anna Politkovskaya award “RAW (Reach All Women) in WAR” and in 2013 the International Women of Courage Award. Wael Hamada is an active human rights defender who had been kidnapped by the authorities in 2011 for his legitimate work in the defence of human rights in Syria, and Nazem Hamaadi is a well-known lawyer and poet, respected for his defence of detainees who were arrested in Damascus during the revolution. Samira Khalil is a human rights activist and a member of a peaceful political opposition party in Syria. via United Nations News Centre – Pakistani activist Malala Yousafzai among winners of 2013 UN human rights prize.